Today, Ruben, Michelle, and I all rented bicycles to tour Hanoi. Bicycles (or “bikes” for short) are two-wheeled devices that function as a mode of transportation. The human rider sits upright on a metal frame and uses pedals to propel the bike forward. The word “pedal” comes from the root word “ped” which means foot. That means pedal bikes, unlike motorbikes, are powered by the rider’s feet. What a fascinating concept. Using my foot power to maneuver Southeast Asia traffic. When we set off for Ho Chi Minh’s Mausoleum, we lucked out. Hanoi offered relatively cool weather compared to Saigon. The sky was overcast, so at least we didn’t have to deal with the sun. The bicycles ended up mitigating that piece of luck, though. Bicycles take effort, especially if you have to stop and restart. Hanoi’s confusing streets forced us to stop at nearly every intersection to check the map or ask for directions. I am not exaggerating. Six-pointed roundabouts and curved one-way streets made going in a straight line impossible. 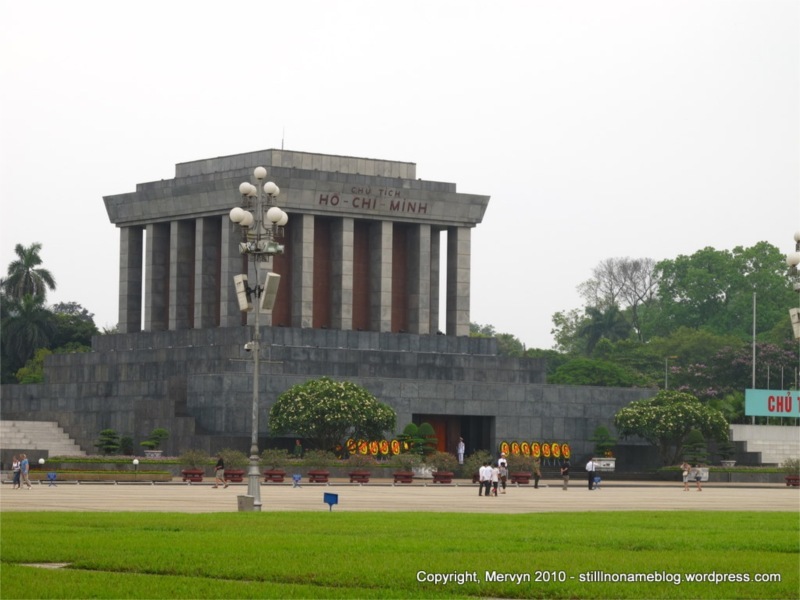 We eventually made it in sight of Ho Chi Minh’s mausoleum and found a place to park our bikes. “No lock. Back by 11:30,” said the guy who handed us a claim stub for our pedal bicycles. It was 9:45. The time constraint didn’t seem to be a problem. Turns out we were further from the entrance than we thought. We had to walk 10 minutes to get to the main entrance. Also, this Uncle Ho guy seems pretty popular. The line to get in to the complex stretched a couple hundred meters from the main gate. Who knew how long the line was once we eventually got inside. Also, the complex is only open until 11:30 a.m. After waiting in line for 10 minutes and getting nowhere near the entrance, I opted to go back and watch the bikes while Ruben and Michelle stayed in line to try to get in. I figured I’d be in Hanoi for a few days after our Halong Bay tour, so I could always come back. Michelle and Ruben were heading straight to Sapa in northern Vietnam, so this was their one shot. I ended up hanging out near the bikes with a horde of school kids who seemed to be waiting for their bus after a visit to their country’s George Washington/Thomas Jefferson. I did get a nice shot of the front of the mausoleum. Turns out I could have visited Ho Chi Minh’s body. Michelle and Ruben got back a bit after 11:30, though they did say the guards made them run through the grounds to the mausoleum itself because the complex was closing for lunch. We headed back to the city center, passing a random giant statue of Lenin. We stopped in at Vega Travel and booked a three-day/two-night tour of Halong Bay. Next stop, the infamous Hoa Lo Prison or, as the American POWs called it, the “Hanoi Hilton.” As with all things in Hanoi, this required some hunting. Down an anonymous-looking street were the remains of one of the most famous prisons in American history. Though, to hear the Vietnamese curators tell it, this place wasn’t so bad for Americans, especially when compared to how the Vietnamese prisoners had it. 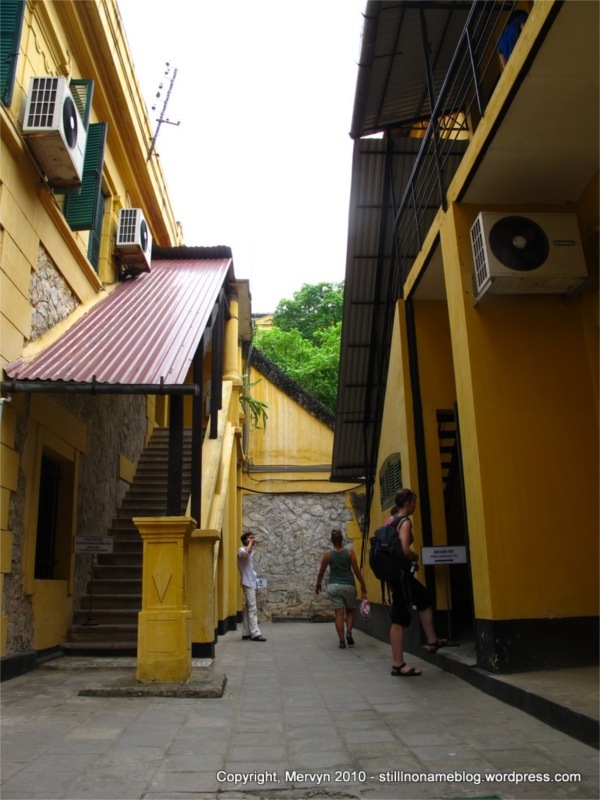 Not sure if you knew (I didn’t), but Hoa Lo Prison was used by the French to imprison Vietnamese dissidents. The huge bulk of the exhibits in the museum are devoted to recounting the horrors experienced by Vietnamese heroes at the hands of the occupying French. In one room sat a guillotine used to behead Vietnamese revolutionaries. Pictures of the severed heads featured prominently. There were life-size statues in a stockade in a large holding room and locked in cramped cells. The same cells that would later hold American soldiers. 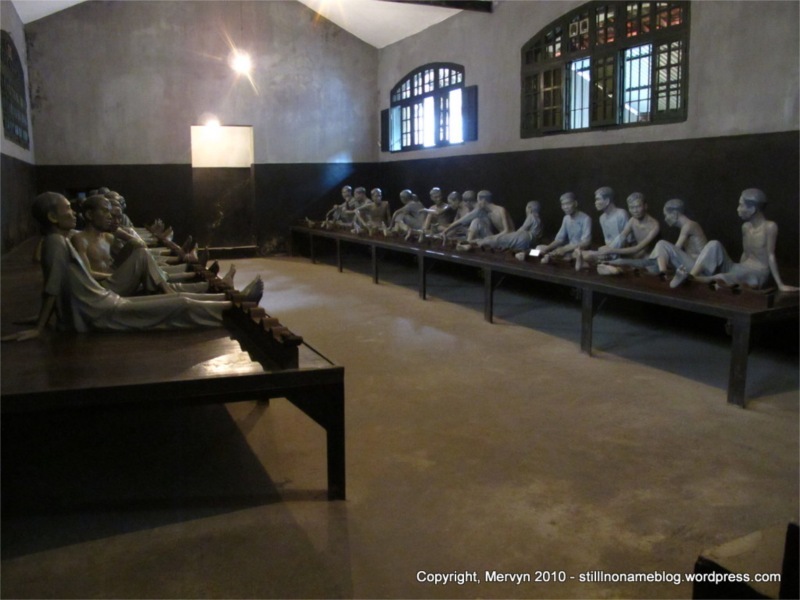 Exhibits detail the torture suffered by freedom loving Vietnamese in Hoa Lo. Pictures show vaguely French-looking guards beating prisoners. The French even incarcerated and tortured women, doing things like pulling off fingernails and performing Chinese water torture. No atrocity is left to the imagination. Creepy mood music fills many of the eerie, concrete rooms. It’s got production value. Most of the prison has been torn down, but the section that remains is quite well preserved. 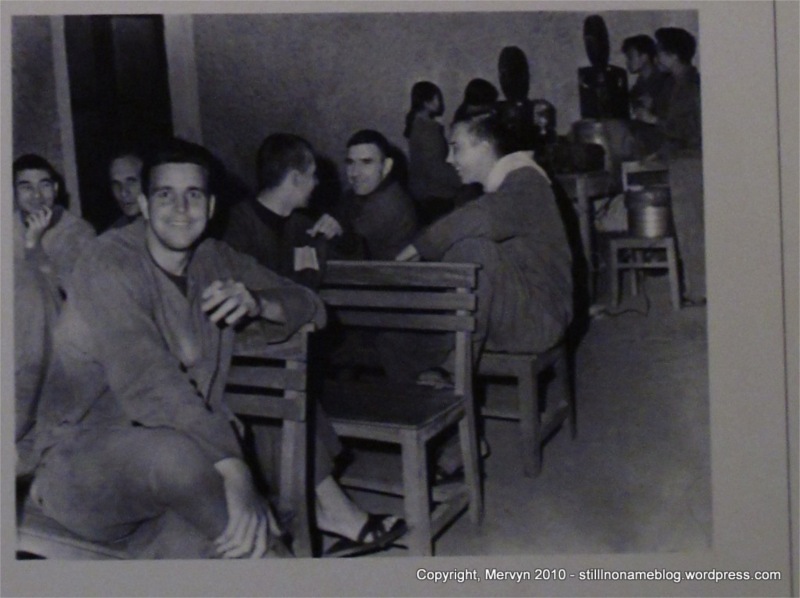 Two small rooms recount the American experience in the Hanoi Hilton, equaling the amount of floor space devoted to documenting opposition to the Vietnam-American War and subsequent visits to the prison by famous POWs (John McCain features prominently). If you believe the exhibits, life in the prison wasn’t so bad for Americans. They got to keep their own belongings including toothbrushes, blankets, cups, plates, books, and tobacco. They regularly got mail from home. They had volleyball, basketball, and chess tournaments. A video even explained that the American’s were so lucky to have been prisoners under the Vietnamese and suggested they got little souvenirs when they returned home. It made it seem like summer camp but with more armed guards. Pictures show GIs playing pool and smiling for the camera. Quite surreal, really. It’s a slanted view for sure. I have a feeling the former POWs might have a different story. It made me wonder, though, how much of our own history we whitewash. Our culture is different of course–there are more incentives to encourage more honest self-reflection. Things like book deals and fame. That doesn’t mean that we always get the whole truth. Imagine if the Vietnamese people only heard the version of Hoa Lo Prison shown in the exhibits. Imagine if the only version of history we heard were what we read in our textbooks. After we’d had our fill, I parted ways with Michelle and Ruben until dinner. I pedaled with my feet to the train station to scout ticket prices to Beijing (expensive). Then I headed back to the Old Quarter to return the bike and grab a cup of coffee. GALLERY: Click to see today’s gallery which includes John McCain’s flight suit, a giant statue of Lenin, and lots more pictures of happy smiling GIs in prison.